The event drew 21 participants with all proceeds donated to Ashland Public Schools. Dirk Blakesley, Buster Welch and Shannon Hall. Public schools in America are being faced with difficult funding challenges. As rural populations continue to decline, schools in rural America experience even greater challenges. Recently, three of the cutting horse world’s most esteemed teachers, trainers and competitors gathered in Ashland, Kansas, to offer their professional expertise and to raise money for the Ashland, Kansas, public schools. Buster Welch, Shannon Hall and Dirk Blakesley spent the day conducting a one-on-one clinic with 21 participants. All of funds raised were donated to Ashland Public Schools. 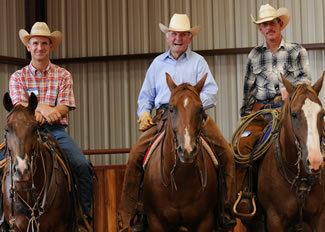 Buster Welch, lifetime rancher, cutting-horse legend, five-time National Cutting Horse Association World Champion Futurity winner; Dirk Blakesley, 2009 NCHA Open Futurity Finalist and professional trainer with more than $1 million in earnings; and Shannon Hall, 1999 NCHA Futurity Champion and professional cutting-horse trainer with more than $3 million in earnings, conducted the one day event at the all-weather, indoor facility at Gardiner Quarter Horses, Ashland, Kansas. This all-star lineup of cutting-horse professionals spent the day with participants teaching the fundamentals of the sport of cutting. The public was invited to attend and many showed up to watch and learn as well as make a donation to the fund-raising event. In addition to spectators and participants, several corporate donors helped make the event even more successful. Shortys Caboy Hattery, Oklahoma City, Okla., Platinum Performance®, Classic Equine®, Farmers Cooperative-Purina, Intervet-Schering Plough Animal Health, Boehringer Ingelheim, Merial, IMMVAC, Inc., and Pfizer Animal Health made generous donations to the event. Gardiner Angus Ranch is a family owned Angus ranching operation located near Ashland, Kansas. The ranch is dedicated to the production of quality beef from gate to plate. The Gardiners use their experience in beef cattle breeding, state-of-the-art technology and data management, to produce Angus cattle that make documented contributions to the beef industry. The Gardiner operation registers more than 2,000 head of Angus cattle each year through the American Angus Association and encompasses more than 40,000 acres in southwest Kansas. The ranch is a founding member of U.S. Premium Beef, LLC. Learn From Champions. Become A Champion. Starting time: 8:00 AM (Clinic will run into the evening or until all work is done). All proceeds from the event will go to the Ashland High School and a portion is tax deductible. 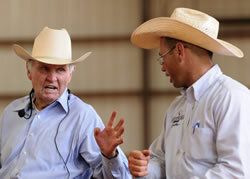 It’s a rare opportunity to spend a day learning from the very best professionals the cutting horse world has to offer. The first 25 to register for the event will have this once-in-a-lifetime opportunity, Tuesday, August 10. 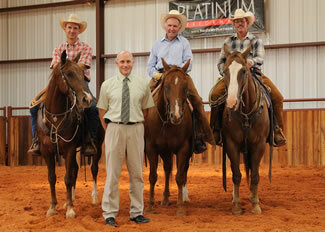 Buster Welch, lifetime rancher, cutting-horse legend, five-time National Cutting Horse Association World Champion Futurity winner; Dirk Blakesley, 2009 NCHA Open Futurity Finalist and professional trainer with more than $1 million in earnings; and Shannon Hall, 1999 NCHA Futurity Champion and professional cutting-horse trainer with more than $3 million in earnings, will conduct the one day event at the all-weather, indoor facility at Gardiner Quarter Horses, 1703 Highway 160, Ashland, Kansas. 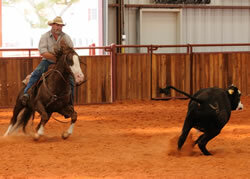 This all-star lineup of cutting-horse professionals will spend the day with participants in both individual and group participation teaching the fundamentals of the sport of cutting. 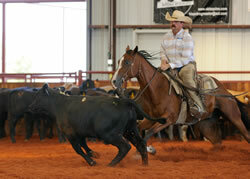 Cost for the event is $500 per student and will be limited to 25 participants and up to 2 horses per participant. Limited stall space will be available. Public spectators are welcome to attend. While there is no charge for spectators, donations to this fund raising event will be appreciated. Entry forms can be found at www.gardinerangus.com. Since clinic participation is limited, the first 25 paid entries will be accepted. Log on to www.gardinerangus.com, print and complete the registration form and mail, along with a check for $500 to: Gardiner Angus Ranch, c/o Mark Gardiner, 2607 CR 13, Ashland, KS. 67831.